public speaking | Get Speaking! I was slightly trepidatious about the size, but my colleague Tammie Lister — who’d given the same workshop to larger groups before — shared with me some of her strategies, like breaking up into smaller circles for some of the hands-on exercises. A couple of weeks ago I also had the opportunity to attend a very large public-speaking workshop given by the authors of Present! 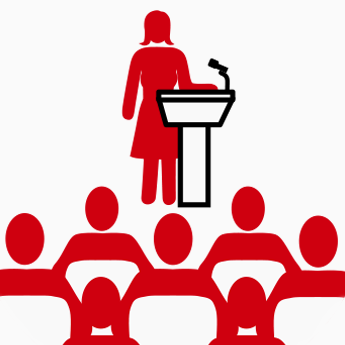 A Techie’s Guide to Public Speaking, which gave me other ideas for handling a big group. And it went just fine! The workshop was very interactive, and the participants had great ideas on everything from what stops people from speaking to the benefits of forging ahead. They brainstormed their own topic ideas, and each wrote up a pitch for a talk. Some were even inspired to submit their idea to an event as soon as possible! The evening also felt like coming full circle, since Jill Binder, who co-ran the original speaker workshop for women in Vancouver that inspired this whole endeavour, happened to be in town and helped me with the group. We were very warmly hosted by Azi Vaziri at the Google Montreal office, who even provided food so folks wouldn’t be hungry coming straight to the event after work. Thank you Montreal Girl Geeks for the opportunity to help a new crop of public speakers get inspired and get speaking! Thanks @zoonini @MTLGirlGeeks @GoogleMontreal for another fab presentation! Tonight's public speaking workshop full of tips & great peeps! Photos courtesy Montreal Girl Geeks and Jill Binder.